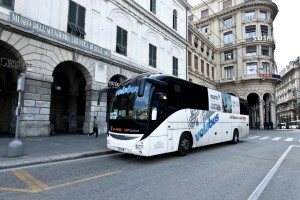 Volabus is the Amt shuttle bus service departing from Cristoforo Colombo airport to Brignole and Principe Train Stations, crossing the city centre. In 30 minutes, you can get the arrival terminal or the city centre by a latest tourist bus equipped with any comfort and a big luggage van. Volabus is a direct daily, comfortable service running 7 days a week, stopping at few pick up points ( to airport only pick up, from airport only drop off). The ticket costs only € 6 for a trip on Volabus plus a 60 minutes journey on the Amt network ( buses, metro, public elevators and funicular railways), in the same day. Have a nice trip with Amt!